Please copy/paste any of the materials you’d like to share about The Meantime program. NOTE: you must add your Marketing for Hippies affiliate ID, which you set up when you register as an affiliate, in the “XXXX” of the url. If you’re in a cash flow crunch and needing to generate a lot of money quickly, I’d like to introduce you to my colleague Tad Hargrave and his program The Meantime – a 30 day cashflow challenge for conscious entrepreneurs, running January 11th-February 8th, 2017. You might have heard of Tad before. He’s the founder of MarketingforHippies.com, NichingSpiral.com and coined the term “slow marketing.” His work is based on notions of long term relationship building and making sure the marketing feels good for all involved. His work has never been “quick fix” or “fast cash” or even “six figures” oriented. But, after enough of his clients came to him in dire straits and needing money fast, he came up with a program just for them. In this program you’ll be taken through a five-step process to go from struggling to generating cash flow as quickly as possible. *Please note that in some cases you’ll need to shorten the url’s for these tweets by using a url shortening program such as bit.ly or ow.ly. YOU WRITE THE STORY OF HOW YOU MET ME (TAD) HERE. You might have heard of Tad before. He’s the founder of MarketingforHippies.com, NichingSpiral.com and coined the term “slow marketing.” His work is based on notions of long term relationship building and making sure the marketing feels good for all involved. His work has never been “quick fix” or “fast cash” or even “six figures” oriented. But, after enough of his clients came to him in dire straits and needing money fast, he came up with a program just for them. In this program you’ll be taken through a five step process to go from struggling to generating cash flow as quickly as possible. We all know that, ultimately, the slow and organic approach works better. We know that, over the long term, delivering quality results is what generates real word of mouth. We know that slow and steady wins the race. We know success isn’t about fancy tactics but about applying simple fundamentals. We all know that. But, what if you need money now? What if, for whatever reasons, you don’t have that kind of time? What do you do in the meantime? Here are four reasons why I think this is worth your time to check out: It’s his 6th time running this program (so he’s had time to work out the kinks on it). As you’ll be able to read in the testimonials on his sales page, people have gotten some really wonderful results from it. This doesn’t surprise me, since he spent months weaving together the best tactics he knew of from his personal experience and that of his colleagues. He is also making a personal guarantee that the program itself will reduce your stress and busyness and that you’ll make at least a $100 profit just for trying. Either you make $100 of new money from the content, or Tad will refund your full tuition plus $100 from his own pocket. If Tad says it’s good, it’s good. P.S. The above link is an affiliate link, meaning, if you sign up for the program, I get some money for that. It’s not why I’m sharing this with you (Tad doesn’t often have new programs and this is a solid one on a topic I thought you or someone you knew might appreciate) but it does help my own business to be more sustainable and I’m deeply grateful for it. And, if that feels funny for you in any way, you can use the link below and I won’t get any money. The most important thing is, whether it’s this program or another, that you get help with your cash flow crunch. Please note: on the Twitter, Facebook and Email templates, you MUST enter your affiliate code where the “XXXX” sits in the url in order for the link to point to you as the affiliate. There’s a lot out there in the world of marketing (even the world of supposed “conscious marketing”) that doesn’t feel “quite right.” If you’ve had this experience too, I think you might like something I came across that was put together by my colleague Tad Hargrave of www.MarketingforHippies.com. 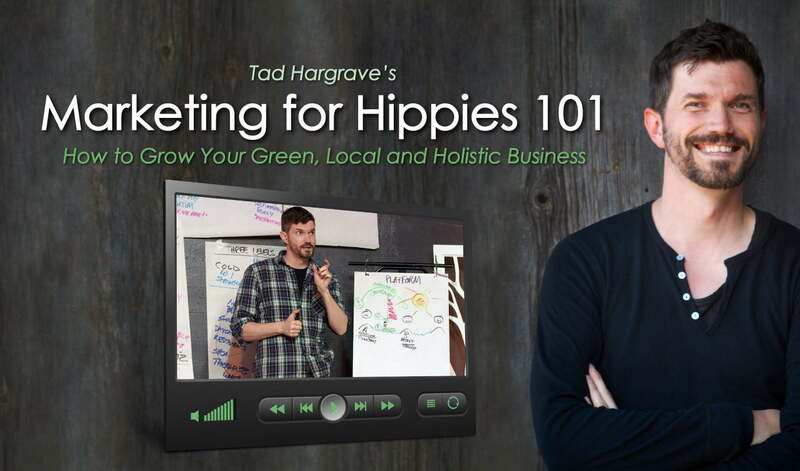 It’s the online version of his Marketing for Hippies 101 workshop. Marketing can feel good. This is the core idea behind it. But for so many people it doesn’t. For marketing to be effective it must feel good. After all, if marketing feels bad, you will avoid doing it and others will avoid wanting to do business with you. 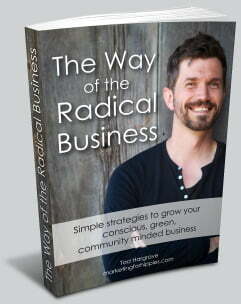 Since 2001, Tad has traveled around North America, the UK and worked with conscious entrepreneurs just like you. Some successful, others struggling. He’s gathered quite the assortment of success stories and strategies right from the horses’ mouths. You might have heard of Tad before. He’s the founder of MarketingforHippies.com, NichingSpiral.com and coined the term “slow marketing.” His work is based on notions of long-term relationship building and making sure the marketing feels good for all involved. You are a conscious entrepreneur running an holistic, green or local business (e.g. massage therapist, life coach, permaculturist). You want to market your products and services without compromising your principles? How can you make sure your marketing gets a positive response and creates warm feelings of trust? Better yet — how do you have your ideal client approaching you, instead of you chasing them?